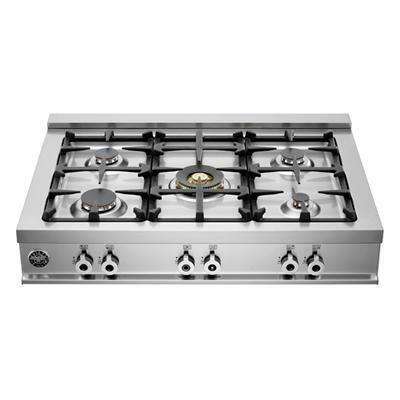 Bertazzoni Professional Series 36", 5-burner range top. 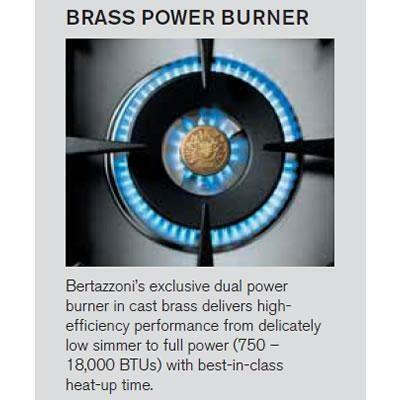 All burners are in cast brass for enhanced performance, with the dual control brass power burner delivering best-in class heat-up times and maximum flexibility thanks to its extremely wide BTU range. Triple-ring burner provides high-efficiency power with a delicate low-simmer function. Power Output Semi-rapid: (2) 6200 Btu/h; Rapid: (1) 11000 Btu/h; Dual Wok: (1) 750 Btu/h - 18000 Btu/h; Auxiliary: (1) 750 Btu/h - 3400 Btu/h. Additional Dimensions Cut-out height: 4 15/16 in; Cut-out depth: 25 3/16 in; Cut-out width: 36 in.